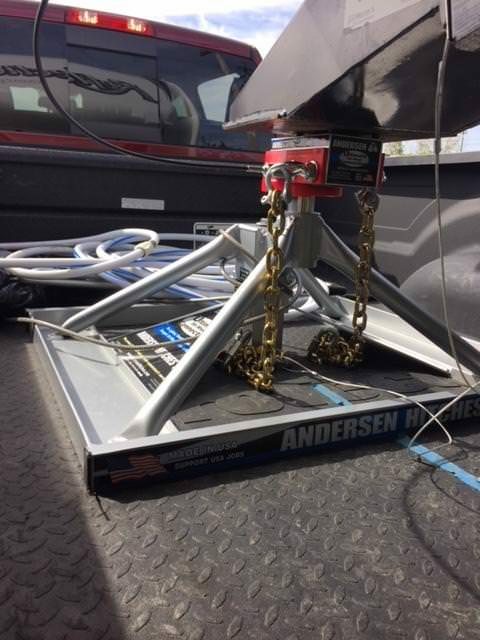 Just completed our first trip with the new Andersen Ultimate FW hitch. 1580 miles and I must say I am really pleased with the hitch's performance. No chucking or bucking. Easy loading and unloading too. I own a Truck camper too so 35 pounds to remove/install was a huge factor. OK, educate me here. I'm new to 5er ownership. Looking at your image, I see all those safety chains and appears to be connected to that red attachment. So I looked at some other photos by doing a Google Search. The Anderson hitch uses a ball, not jaws, right? So I'm assuming that red thing transitions the 5er king pin to attach to that ball. Thus, the need for all those safety chains attached to the red thing? Am I correct so far? So, if the King Pin is connected to the red thing and the red thing is connected t the Anderson ball, that means there's another layer of potential failure, meaning trailer separation from the truck ... thus the need for all those safety chains? Apart from having a much lighter hitch assembly in the bed of your truck which apparently is very easy to remove and very easy to handle, I don't see any real advantage to the traditional jaws type hitch. OK, like I said, I've been a new 5er user for only 5 weeks and trying to learn a whole new way of life here. So, educate me? If the Andersen is really that good, why the need for all the safety chains? I just don't get it. Only reason I added the safety chain kit is because I read that California, Indiana,and Texas commercial safety chain laws require chains on all ball mount hitches. I travel thru Indiana and Texas this last trip. Gray area for private owners. Thats all. looks like another happy Andersen user getting blasted again..... here we go again. anywayz thanks for the report BR50. I've got a buyer for my 5th wheel hitch and have been looking at the Andersen and the same as PullRite SLR model. At 76 years old I'm not as strong as I once was plus I pull GN trailers anyway so hooking chains isn't a big deal for me..
Where's the blasting? A poster asked some legitimate questions. No sense in overreacting. Yes, some posters on the forum really dislike the Andersen Ultimate, but I don't believe this poster is one of them. No, not at all. Sorry if I came across a bit abrupt. I'm trying to learn as much as I can. Now that I have a 5er myself, I can finally connect with these types of posts, and that raises more questions for me. Assuming you had a jaws type hitch before, you mentioned two issues: weight and clunking. You evidently remove the hitch from the bed of your truck, thus the need for something lighter. My hitch is new, I've towed less that 500 miles now with it. I don't experience any noticeable 'clunking' and I've not had to remove it yet. Mine does separate into 2 pieces, both weighing about 35 pounds (so I was told). Is the "clunking" due to wear and tear, or was your original jaws hitch just a little bit off causing the clunking? I guess what I'm asking, in time, can I expect mine to wear and cause clunking eventually. About those chains, what you described makes perfect sense. I knew chains were required for a trailer of any sort, but I didn't know there were laws on the book for hitches such as this specifying a "ball" hitch. It makes perfect sense why you added the chains. I'm from Indiana all my life and had no clue that chains were required because of the "ball" requirement. I thought it was just trailer. Even that makes sense now as every conventional "trailer" is pulled by a ball hitch. Thanks for the education ... I'm still learning! Hey no problem... Just wanted to post my experience with the Andersen. Sure the B &W companion is also a fine hitch. Just wanted a hitch that was lighter. As far as noise or bucking. I only spoke with folks with regular cheaper FW hitch complaints. After having the Andersen it would be difficult going back to a conventional hitch, just too many advantages over the conventional. Although I don't have the safety chains,I have no plans to get them . Good to know! Thank-you! And um... glad you had a good, happy, and successful trip! Add Arizona to that list of chains required for all ball hitches.